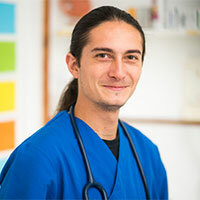 George has been working with us since 2017 as a Veterinary Surgeon. George graduated in 2015 from the University of Agriculture Sciences and Veterinary Medicine of Banat, Timisoara in Romania. George enjoys general practice, performing investigative treatment and working with a varied caseload.